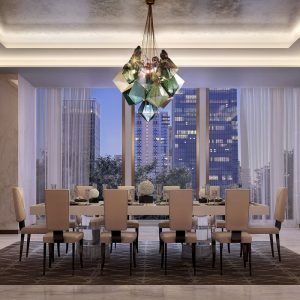 The tallest residential building to rise to date in Hudson Yards officially launched sales this month. 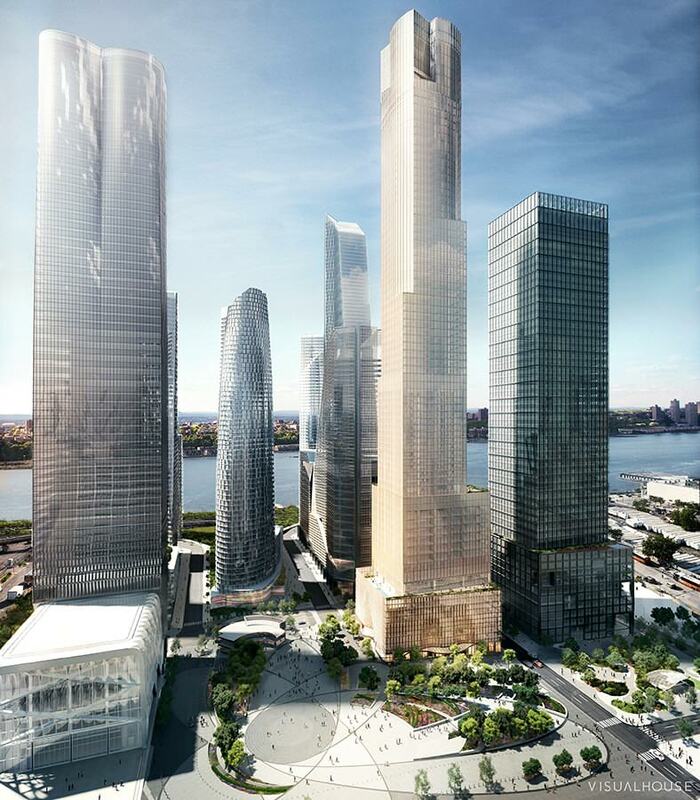 The 92-story 35 Hudson Yards was developed by Related Companies and Oxford Properties as part of the new west side neighborhood. Spread across 28-acres, the first phase of development includes more than 10 million s/f of residential, office and retail space. 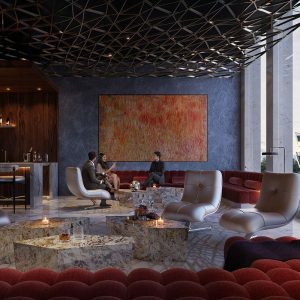 Luxury brand Coach anchors the 10 Hudson Yards office tower that opened in 2016; 15 Hudson Yards opened its apartment space last summer. The Shops opened March 15 along with Mercado Little Spain, a stretch of street-facing bars and restaurants. 30 Hudson Yards, the office tower with the glass observation deck, has opened. Bordered by 30th Street and 33rd Street in the north and south, and Eleventh and Twelfth avenues in the east and west, it will have five more apartment towers, an office building, a school and a third phase of High Line park going right through the middle. 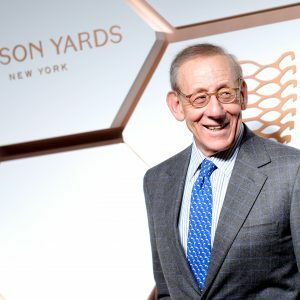 “Our ambition for Hudson Yards was to create a great neighborhood, with experiences and opportunities for everyone,” said Related CEO Stephen Ross during the opening celebrations earlier this month. 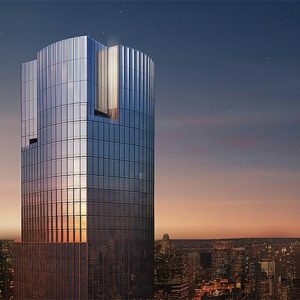 35 Hudson Yards will blend a 212-key Equinox hotel with 143 apartments located between the 53rd and 92nd floors and a chunk of offices in the middle. The building will have 22,000 s/f of amenity space, a flagship Equinox club and spa on the fourth and fifth floors and ground-floor retail with tenants such as Soul Cycle. David Childs, the Skidmore Owings & Merrill architect behind the buildingʼs design, said the aesthetics were a vital part of the concept. He said much time was spent debating the developers which materials would allow the building both to blend with its Hudson yards neighbors but also stand out as a landmark in its own right. Recalling his back-and-forth with Ross, Childs said they were fond of the creamy and light limestone look of the Four Seasons Hotel on East 57th Street, but the stone is more suited to Paris and its temperate climate than the harsh winters of New York. Ultimately, they found the perfect stone called Jura limestone that was sourced from a Bavarian quarry that was almost as hard as granite but offered the “lovely warm soft color” of limestone, Childs said. The building itself offers a twisting spiral look of contrasting glass and stone that is dense at the base and gets lighter as it ascends until it “evaporates” when it reaches the peak at penthouse level, Childs added. While Childs was responsible for the exterior allure, Tony Ingrao was tasked with creating an inviting and comfortable space inside. The New York-based interior designer used a “purposeful stylistic” design for the lobby, which has the shape of a nautilus shell, spiralling in towards the elevators. 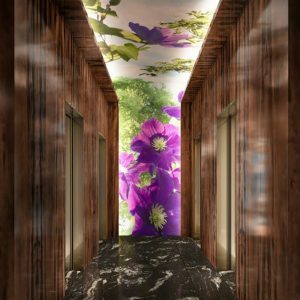 A large-scale flower tapestry, created by Swedish artist Helena Hernmarck, wraps around the walls and ceiling of the elevator landing, reflecting rich purple and vibrant green colors all over the space. The lobby’s flowery tapestry will be updated to match the seasons. The apartments themselves range from two-to six-bedroom and start at $5 million. Penthouses have yet to be priced. Being several hundred feet up in the air, residents can enjoy views across New York City through 11 ft. floor-to-ceiling window. Neighboring buildings loom large and you get an inverted look at The Vessel, the swirling and zig-zagging public art installation situated in the middle of Hudson Yards. The tower offers a luxuriously self-sufficient lifestyle for indigenous residents. Three restaurants will offer residents priority reservations, two on the ground floor and one of the 24th. Stephen Starr, the Philadelphia-based chef, will also be offer delivery to residents, according to Related. Residents can host their own dinner parties and events in multiple private suites, including a screening room with a private bar and residents lounge with pool table and TV. For those who want to work where they live, 35 Hudson Yards also has two conference rooms to host business meetings that residents can book. And those looking to play, there’s a golf simulator that replicates the best golf clubs around the world, according to Sherry Tobak, senior vice president at Related. Even though there will be a 60,000 s/f Equinox offering in the lower floors of 35 Hudson Yards, the building will offer a 24-hour residents-only private gym. 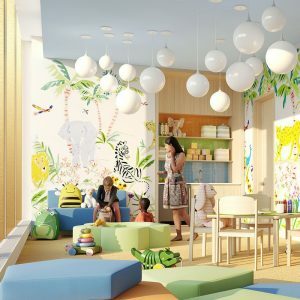 The building also includes a private meditation room, a children’s playroom, and several outdoor terraces. 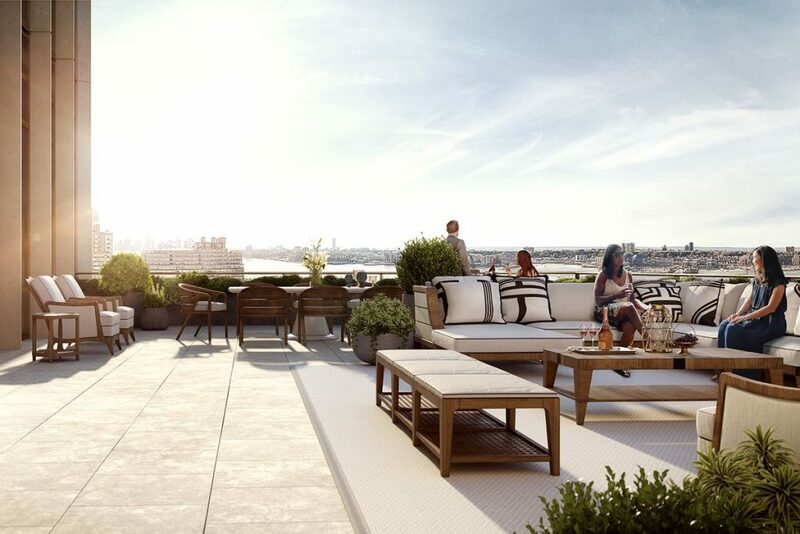 “Centrally located in the heart of this exciting and new neighborhood, 35 Hudson Yards is the ideal location for enjoying everything Hudson Yards embodies, and I have no doubt it will set a new benchmark for superb residential living in New York City,” Tobak said. 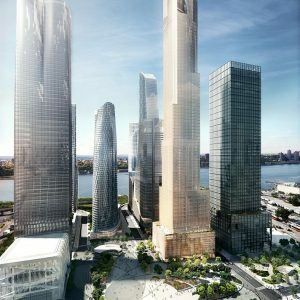 According to the New York Times, Related and Oxford are looking to sell out 35 Hudson Yards at an average of $4,100 per square foot when it opens in the fall. The average price of a New York City new development condo last year was $2,267 psf, according to CityRealty.